Firstly we have learned that complex changes can be delivered quickly if you focus on the minimum viable product. Secondly, cloud solutions and migration techniques are maturing and becoming easier. And finally, we learn that BCU is going places! Well, we kind of knew that already, but its good to re-learn. The three cloud implementations are staff e-mail, our Virtual Learning Environment (VLE) and Oracle cloud ERP. Email in 55 days. We recently decided to migrate staff email to the cloud. Student email has been delivered from Microsoft’s 365 cloud for some time, but staff email has been hosted on premise. That was causing issues with other cloud migrations and created some risk, so we decided to change that. We made the decision, went to market for a partner, signed up with ANS Group and 55 working days later, we have migrated all 5,345 staff email mailboxes to the Microsoft cloud. VLE in 52 days. Previously, we migrated Moodle and Mahara, our Virtual Learning Environment (VLE), from an on-premise solution to an externally hosted “Cloud” provision from CoSector. The VLE is the lifeblood of a modern university, with courses, videos, reading lists, online essay submissions and so much more. We wanted to ensure the student experience is as reliable as possible and external hosting provides us with vastly improved resilience. It took just 52 days to make the decision, agree the procurement, resolve the contract, fix some technical showstoppers and migrate to CoSector. Oracle ERP in 12 months. We also have delivered Oracle’s Finance and HR Cloud ERP system in just under a year. This was a migration from separate legacy systems, with a revised chart of accounts and challenging data migration for a relatively large organisation. This gives us access to world class business solutions that we can drive transformative benefits from over the coming years. With ongoing support from Oracle Consulting, our Oracle cloud journey continues, with Payroll due to go live later in 2019. So that’s one for the back-office, one for the customer front-office and one from across the office. Our technical staff, users, partners, project managers and sponsors have all worked wonders to achieve this. Too many to mention you all, but Tahir Yousaf, Lee Bingham, Lilia Pegg and Matt Peers all deserve special mention. Well done to all of you and your teams. Of course, there is more to come from BCU, as the strategic direction to cloud continues to gather pace. “One to watch”. An elderly lady with mild dementia has a fall and goes to hospital. Once her medical needs are resolved, she needs to be assessed for social care; but she waits too long on the ward because social care and NHS care are not joined up enough. When she is finally discharged, she is considerably more confused and has a more complicated care package – costing more and reducing her quality of life. Meeting the double challenge of an ageing population and reducing budgets will be the make or break issues of local public service. Over the next decade, these two factors will amplify the creaking sound of local public services. An ageing population is a population with increasing frailty, dementia and related problems. This creates exponentially increasing demands on health and social care as well as on charities and police services protecting vulnerable people. Ongoing organisational efficiencies – whilst essential – are insufficient to meet these challenges. Integrated working across Local Government, NHS, blue lights and third sector is essential. Preventative measures in social care, community policing and public health, addressing root causes are “must have” solutions of 2016 and beyond. Integrated working requires shared objectives, shared business processes and shared information systems. It does not require big national systems though. Instead it requires local public service partners to prioritise their integrated working requirements and work out what information sharing works best for them – and to implement their answer quickly, effectively and with shared learning. As separate independent legal entities, each of these organisations is struggling to balance their books, so the notion of investing in each other’s efficiencies is hard to swallow. But its likely to be the only long term way to meet the double challenge of an ageing population and austerity. 2015 saw the first of these local integrated working arrangements beginning to take shape. The next decade will have to see much more. By 2025, more than a third of the UK’s population will be over 55. For all of our futures, let’s hope that integrated local services have been a triumphant success. I have many cloud deployments and have found “the cloud” to be a fantastic answer to many IT provisioning challenges. But here’s the learning; “The Cloud” is not necessarily best value for everything. I run the IT services for a Local Government authority where I am putting more and more services into the cloud. I have a blended cloud solution, with some services from a conventional data centre and some from the Cloud. I have a dozen systems from cloud providers, either live or in the midst of a cloud migration project. These range from a benefits portal, to schools email, to theatre event management. That represents a good portion of my enterprise systems. Some remain in our data centre, because there is not a compelling case to migrate them anywhere else. Like every government agency we have numerous legacy applications that run reliably and have done for many years. These remain in the data centre. Some systems in the cloud, some in the data centre; a somewhat pragmatic approach that the cloud purists seem to deride. But more of the context. Like many local authorities, we recently agreed a plan to reduce our building footprint and in the process turn the data centre into a building site. So the existing data centre had to go. “Fantastic opportunity to put everything into the cloud”, I thought. That would give the organisation many benefits and I’d be a hero of the digital fashionistas. Imagine my surprise and disappointment when I looked at the actual numbers, not the theoretical white paper ones, and realised it will be considerably cheaper to build a replacement data centre than any other viable option. “Moving everything to the cloud” has many possible meanings. It can mean moving each system to a system specific “true” cloud provider. So you end up with as many cloud providers as you have systems. To be cost effective, you procure as and when systems become available with cloud options and as they come up for renewal and refresh; which we did not have time for with the building project imminent. Or Cloud can mean having someone else provide the whole data centre via “IaaS”. We used to call that “hosting”, “outsourcing” or “co-location”, but now the vendors need to call it cloud, for obvious marketing reasons. The co-location option looked most desirable. I started with G-Cloud (Digital Market place), of course to see what the options and prices were. It is widely known that G-Cloud Framework prices are capped maximums and every supplier says they can beat their own prices on G-Cloud. So, of course I spoke directly to the suppliers as well. I also spoke to most local public service organisations, across Health, Police and Local Government in the region, to see if they had capacity to host my entire data centre. None did, but I found two Local Authorities, one in Scotland and one in the South East who could. Their prices were very similar to the commercial co-location providers. The Crown Hosting Service had not at that time been launched. Finally as a comparator, I also looked at the costs of building our own data centre. In our case it turned out to be substantially cheaper to buy a data centre, than to rent from the cloud. We own our own property and within that we identified a good space for a replacement data centre. This space could not be used for any other significant purpose. The major advantage of this location, is that it is on the same site as the major Council office buildings. So I don’t have to pay the data communications costs to connect all our enterprise users to our enterprise systems. This avoids a material cost. Taking the data costs into consideration, on a like for like basis, co-locating in the cloud would have cost two to three times the cost of self provision. I also host some systems for other authorities and am in discussions with commercial providers relating to hosting their services in my data centre – generating revenue for the authority, which would otherwise be lost. The economic case for building our own data centre is extremely compelling. When the sales director of a leading cloud/co-location vendor tells me he cannot compete on costs against a self build with data costs, I know just how compelling that is. Cloud is great when you are looking for elasticity, agility and resilience. So for those applications demanding that, it is worth paying extra for. But where we know our system workloads do not have significant fluctuation and where we can enable internet access for users, with reasonable resilience, why pay more? So I emerge from this with a fairly common blended cloud architecture. Some on premise, some hosted elsewhere and some from true cloud. Some people call the data centre a “private Cloud”. I don’t think that’s helpful, or even technically accurate. Over time I will, of course, migrate more services from Data Centre to cloud and procure more new services from the cloud. But I also will implement more services in the data centre, if that’s the location that works best. I was amused by the press coverage as our data centre plans became known, but not altogether surprised. Fuelled by suppliers who wish to generate more revenue from cloud services (“cloud” has taken over from where “outsourcing” left off), some commentators seem to believe that there is only one answer to everything and that is cloud. In my experience, there is never one answer to everything. There are innovations that need to be applied in judicious ways, where there is a business case. To run a cost effective service, you need a certain amount of distance from believing in every “next big thing”. The business case is the king. Fashion is not a good enough reason. I think of this in terms of the Gartner Hype Cycle. In the peak of inflated expectations, “enthusiastic and strong feeling around new forms of media and technology, in which people expect everything will be modified for the better,, is a common characteristic. We seem to be there with Cloud right now. Moving from the peak of inflated expectations with “everything to the cloud”, to the plateau of productivity with a “pragmatic blend of cloud and data centre”, seems to me to be a reasonably likely forecast. I understand that there is good research emerging to support this position. Do not be deceived by the ornament of Cloud. It’s really good for some things. But that does not make it best for everything. We think we have found a solution to a common problem that all organisations face. As the technology industry produces more and more innovative, mobile devices (like tablets, smartphones, phablets, wearable technology – in all their millions of variations), every user wants something different. And they want more. More flexibility, more devices, more choice. We give them choice and cap costs with our “points” scheme. Devices are assigned nominal points based on total costs. Privately owned devices attract far fewer points than corporately procured ones. Users have 24 points to play with and can have whatever devices they want within their limit. It’s a good mix of technology innovation and policy that enables us to say “yes” to user choice. – It maximises user choice. – It caps corporate cost. – It encourages users to try BYOD (Bring Your Own Device). – It places the decision making away from corporate IT and with the user and their cost centre manager, where it belongs. The next device innovation can easily and quickly be incorporated. For example, say wearable technology suddenly takes off and my users want to see their work emails in their glasses. So long as that works with the secure BYOD solution, I’ll be quick to say “Yes”. Gone are the days when the corporate IT department could define standard user types and issue them with standard and limited mobile devices. Two people doing exactly the same role may now want and need quite different devices. That’s because what they use at home offers them choice, they want the same choice at work. To do their job to the best of their abilities, one may want an iPad and a smartphone. Another may want a laptop. Some really only want to use Apple kit and some want to use Windows or Android – because that’s what they are familiar with from their other walks of life. People get quite passionate about this and if you give them something they don’t want and have not chosen, they will always find fault with it. Which drives up cost and drives down customer satisfaction. So the users want more, and want more choice – but the finance director wants the total cost to be less. Even BYOD comes with a small cost. That’s the challenge. Not all of the solution rests with allowing people to “bring your own device” (BYOD). Some people will simply not do that because they strongly believe the employer should provide the kit. Even though they buy their own pens, cars, clothes and other paraphernalia they use at work. They will therefore not be as effective at work as they might otherwise be. Also BYOD brings its own costs – for licensing, support and infrastructure. There is a bigger solution, beyond and incorporating BYOD. At Solihull, we have introduced a “Choices” scheme. First we implemented two secure technologies that deliver BYOD. One is a quick and simple access to key information needs. 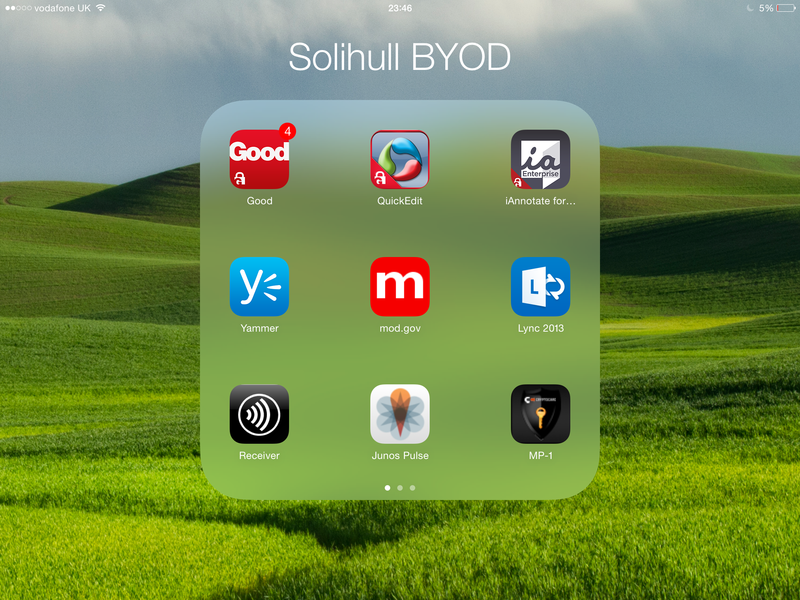 (We are proud that Solihull is one of the first Good for Enterprise public sector innovators) The other gives a full desktop experience but requires the user to spend more time with authentication. Users can choose which one they prefer, or have both. Then we agreed that the organisation would buy users mobile devices, if they would not be using BYOD. And we set up a way of capping the cost that the organisation incurs from offering more choice. The solution allocates each device type a number of “points”. 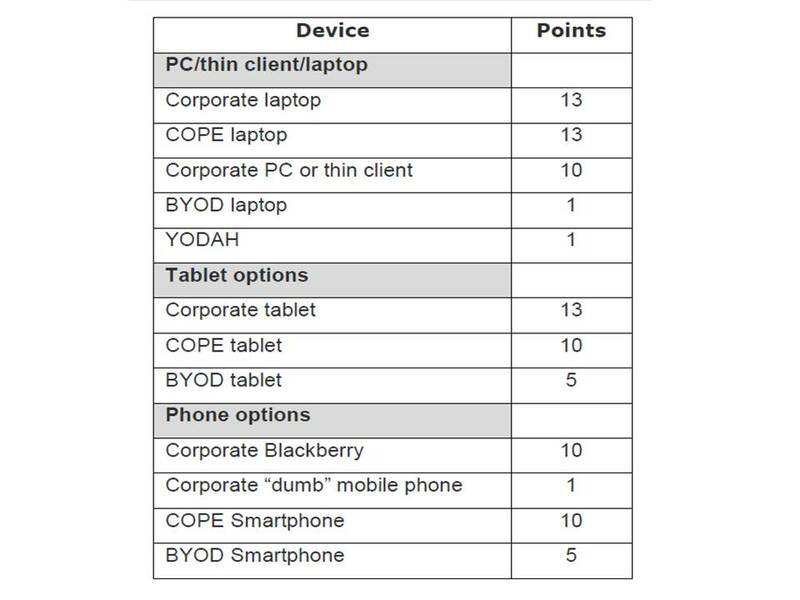 It also allocates each BYOD device type a number of points. BYOD devices have much fewer points than corporately procured devices. Users have a capped number of points from which they can make their choices. The table above shows how it works. The users each have 24 points to play with. If you want a corporate laptop and a corporate smartphone, you have not got enough points for a corporate tablet as well. But if you want to bring your own laptop and bring your own smartphone, we’ll buy you a tablet if you want one – and your cost centre manager approves. The cost centre manager sometimes needs some help making the right decision. When a person asks for a corporate device, even if it is within their points allowance, we will question them closely on exactly what they will use it for, where they will use it, when they will use it – and only agree to the purchase if it is the right piece of kit for their job requirements. We’re in the business of minimising Council spend on IT, and maximising return on investment – not just capping spend. With a securely managed, cost controlled and leadership encouraged approach to BYOD; its good to be the IT department that says “yes”. BYOD: Bring Your Own Device. A privately owned device (laptop, tablet, smartphone or other device) that has security software running to enable it to safely access the corporate network. COPE: Corporately Owned, but Privately Enabled. A device which accesses the corporate network as though it was a BYOD device. YODAH: Your Own Device At Home. Same as BYOD, but where the device is privately owned and always used from home. Local Government digital needs more pace. It also needs a disruptive approach to the supply chain. Otherwise it will carry on getting just a little bit better every year and carry on duplicating costs. Becoming radically better very quickly and driving out substantive costs is not going to happen with the current ways of working. My experience comes from being part of two local digital steering groups. At the LocalGovDigital steering group with Carl Haggerty, Phil Rumens and others we discussed the excellent ideas that people have but everyone raised concerns about how much you can do from volunteers. Capacity is the issue. At the GDS Local Dashboards steering group with Matt Harrington, Kate Sahota and others we discussed the pace at which we can move, the big transformative ideas we have – but GDS is focussed on Central Government. Capacity is the issue. A Local GDS could provide that capacity. But there is something much bigger that a Local GDS could do. Local Authorities keep buying digital systems from the same suppliers. A few write something with Open Source, but even fewer manage to share that widely. There’s a reason why a single web site for local government wouldn’t work, though. They also procure business solutions by looking at their local needs first and assessing the market against their requirements. It’s hard to mandate a local authority to do anything. Its best that they to want to. So a Local GDS needs to create a value proposition that Local Authorities would want. The disruptive potential rests in the value proposition. If there was an Open Source web content management solution, backed by a Local GDS and continuously developed by a community of Local Authority digital enthusiasts – it would be a compelling proposition for any authority. Enthusiasts like the Digital Makers at Local Gov Digital would contribute to its development, we agreed. When an authority chose to replace its web solution it would find an offer from Local GDS that was the most affordable, had the best roadmap for development and was the most well suited to their requirements. Most Local authorities would be unable to not procure such a solution. Over time it would become the standard. And sharing would follow inevitably. If any council develops a solution for a specific challenge, it becomes absorbed into the Local GDS product, supported and made available to every council in the “club”. Free of charge. Local is not just about Local Government. Local GDS should also support other local public service organisations, particularly third sector. More and more local delivery will be jointly delivered and Local GDS would recognise and respond to that. The front end of a web site accounts for just 20% of Digital costs. The bigger costs are in integrating with line of business systems, so that the user experience is a seamless interaction with the authority. As authorities develop deep solutions with Local GDS, they will make these available as well. Driving deeper and deeper into the digital infrastructure. This creates the opening for a business architecture that disrupts the stranglehold that a few suppliers have over the sector. Right now the Care Act is creating new digital challenges. Across the country councils are scurrying about to find digital solutions. They are re-inventing and duplicating effort – imagine if a Local GDS existed now. It would be commissioning solutions that could be deployed with minimum fuss and little cost to all authorities who chose to be part of it. We have probably missed the opportunity to create LGDS in time for the Care Act. But there will be another big thing. Let’s get ready for that. Every Local Authority has done something well with Digital. No authority has done everything well! But if we put all the good bits together, we will deliver a substantially better Digital experience to our users at a substantially reduced cost. In a time of austerity, Local GDS, or something like it, is not just a good idea. It’s a responsibility.